Posted on June 9, 2017 by Matthew Mahalik. On this deployment in the Northern Plains, capping was a concern from the beginning. 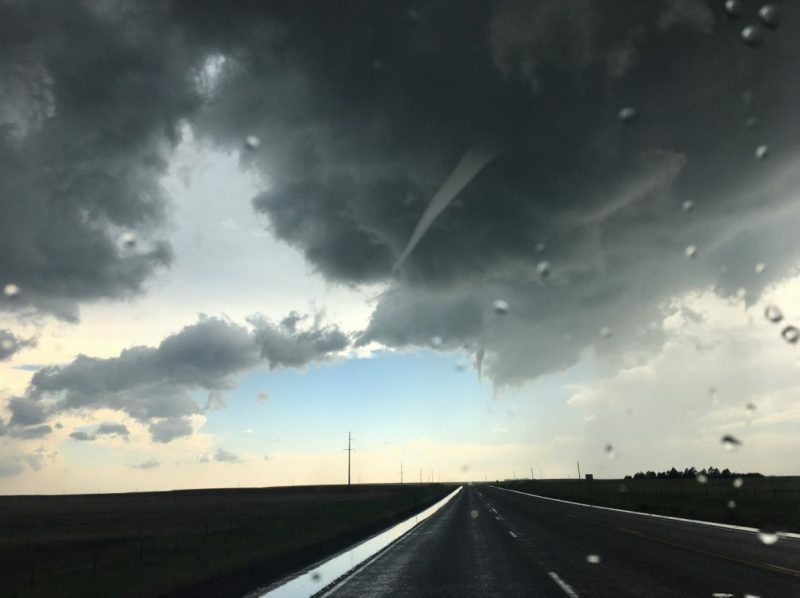 A front was draped across North Dakota, and conditions were favorable for significant severe weather not far from the Canadian border. This trip quickly became a repeat of our previous deployment in Kansas where the moisture was streaming in as expected, but would need to reach the hodographs more suitable for supercells. In the more favorable shear zone, near Minot, North Dakota, we watched as a handful of showers initiated. We launched a sonde right in front of one that produced its first precipitation and thunder soon after. It initially moved very slowly and produced a downburst and, in turn, strong outflow. This created a huge amount of blowing dust and enough rapid ascent that disorganized scud clouds formed all along the gust front. 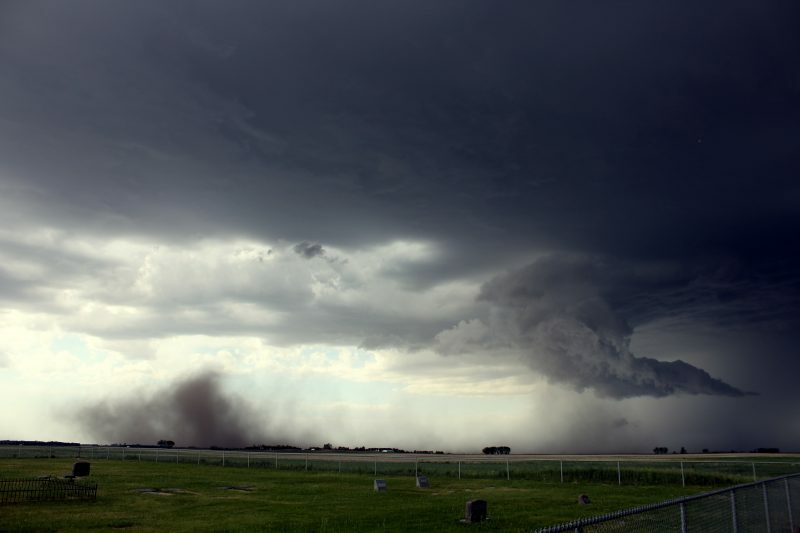 The horizontal rolling motion began to rotate, but the low-level scud was completely disconnected from the cloud base — a bizarre structure. The scud eventually consolidated, producing a finger of low clouds reaching down from the elevated base. The dust blowing outward began to get sucked back in and up, signaling a suddenly intense updraft. We collected data very near the updraft base until we observed strong rotation and a funnel cloud. A huge possible microburst ejected a surge of heavy rain and hail embedded in winds so strong, the storm suddenly rushed forward. With zero visibility, we stopped for safety. For a few minutes, winds topped 80 mph regularly and peaked at more than 100 mph. We let the storm pass and were ready to move on, since storms like these rarely recover from gusting out so severely. However, as we started to drop south toward another weakly rotating storm, our original cell re-organized itself yet again, reigning in the outflow and persisting its low-level rotation. But it also maintained its rapid, 45 mph motion to the east, meaning that we could not catch back up. The data collected here was exciting and raised even more research questions: How often do these winds really occur without any direct measurements? What was the vorticity like in these features? Why was there no tornado if there was so much momentum? These were all things the crew pondered as we drove back south.